‘On the empty tomb of Rosa Luxemburg and Walter Benjamin’s critique of violence’, abstract by Anthony Auerbach. The project outlined below stems from my informal paper on Benjamin’s ‘Critique of Violence‘ and my research for Aerial Reconnaissance Berlin as part of the International Necronautical Society’s Inspectorate in Berlin. It was prompted by the conference Aesthetik der Gewalt organised by Anna Pawlak and Kerstin Schankweiler at the Kunsthistorisches Institut of the Universität zu Köln, 11-12 Jul 2009 and is supposed to appear in the Tagungsband. Walter Benjamin’s ‘Zur Kritik der Gewalt’ [note 1] appears to be an anomaly for an author best known for his aesthetic writings. The article could have seemed even more incongruous to readers immersed in the ‘contemporary European conditions’ [note 2] whose tumult is barely acknowledged in the text, but whose resonance would hardly have needed amplifying in 1921. Recent commentaries have affirmed the abstract, esoteric (even prophetic) aspects of Benjamin’s essay, while the historical context in which it was written has faded. Painting the broad historical canvas of Germany in the years following the First World War would certainly highlight the violence of the political and social struggles which erupted when the old regime quit the scene. But such a picture, sensational though it may be, would not amount to a reading of Benjamin’s ‘Kritik’. For a critique of the aesthetics of violence — that is to say, a critique of the entanglement of violence and its representations — I propose a different history, working backwards from a present particular of our own contemporary conditions as readers, to intersect with Benjamin’s as a writer. The empty granite sarcophagus inscribed for Rosa Luxemburg in Berlin’s Zentralfriedhof is one of several funeral sites from which her body has absconded. The Gendenkstätte der Sozialisten [note 3], like the monument not far away which announces ‘Auf diesem Fundament stand das Revolutionsdenkmal’ [note 4] — and the Revolutionsdenkmal itself [note 5], which stood at the site where Luxemburg’s empty coffin was first buried in 1919 [note 6] — is an iteration of a cult that compels repetition, not revolution. There might be some irony in such a cult arising from the lost remains of a political incendiary whose own reflections on violence anticipated something different. But it was Luxemburg’s violent death rather than her literary or political legacy that secured her after-life as martyr and icon. The compulsion associated with her empty tomb suggests the force Benjamin characterised as ‘mythic’ that binds violence to repetition and dooms revolution from the start. Benjamin’s critique moreover prompts a reassessment of Luxemburg’s theory of violence to which it may already be indebted. What Luxemburg and Benjamin seem to share is shaped not by a critique of violence per se, but by their opposition to the war of 1914–18 and a critique of the romantic and idealist aesthetics that supported it. 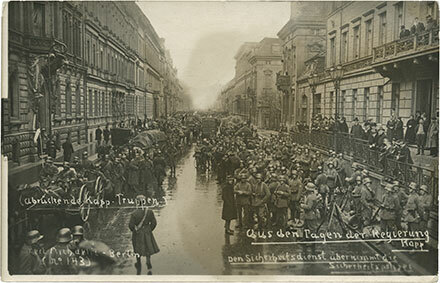 Changing of the guard: troops in the streets of Berlin during the withdrawal of Freikorps militia that supported the ‘Kapp Putsch’ of March 1920 (picture postcard, collection: AA). 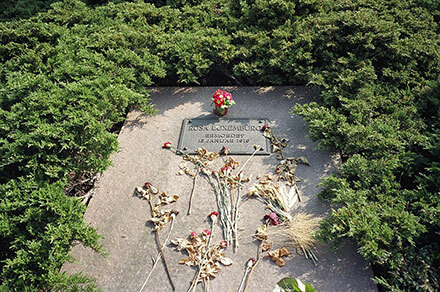 The tomb of Rosa Luxemburg where no body was reburied in 1951 (photograph: AA). 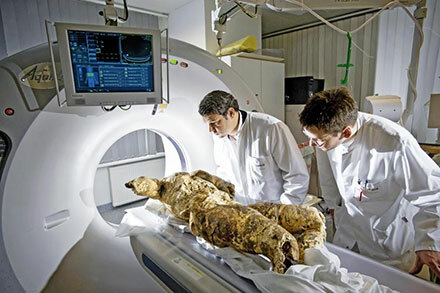 Photograph issued by the press office of Berlin’s Charité Hospital showing Michael Tsokos and an unidentified pathologist posing with the remains supposed to be of Rosa Luxemburg.